Understand that perimeter is a measure of the distance around a shape. Find the perimeter of different right-angle polygons. Answer questions involving perimeter using appropriate units of length. Generate shapes with equal areas that have different perimeters. Develop efficient strategies for calculating the perimeter of a rectangle. This worksheet allows students to compete against each other by seeing which landscaper can make the most... (more) profit when creating a flower bed. This CER worksheet allows students to analyze a landscaping design by understanding the relationship betw... (more)een perimeter and area. They then state a claim answering the question, "Do all gardens with an area of 36 square yards have the same perimeter?" and support it with evidence and reasoning. Adapted questions focusing on area and perimeter. This is a metric version of Fido's FLower Bed. The only part that is not metric is the message on the bo... (more)ttom of the gizmo. 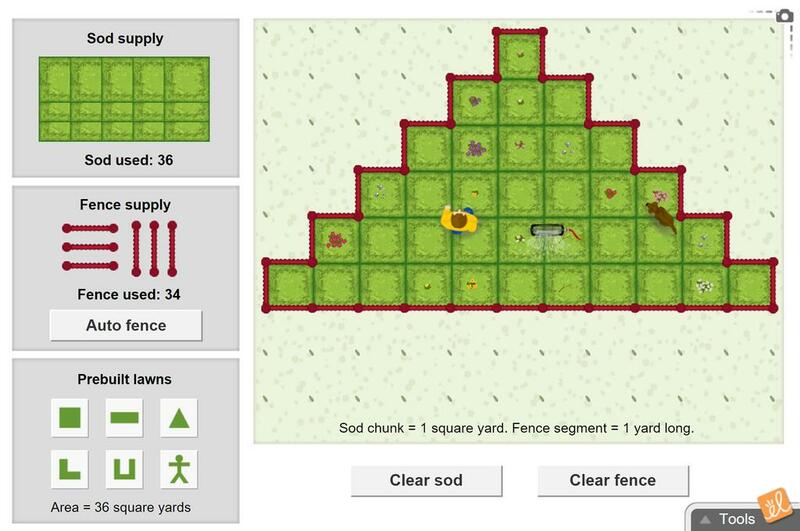 In this project-like activity, students calculate perimeter and area as landscapers to make the most prof... (more)it. Strategies such as what shape will minimize perimeter and maximize area are used. This is a great quiz for after students learn about both perimeter and area from a conceptual point of vi... (more)ew. Lots of fun for kids having trouble with Perimeter and Area! Great visual- easy for students to differentiate between area and perimeter! This gizmo forces students to examine the difference between area and perimeter while emphasizing the connection between the two. I liked that the students could very quickly see that when comparing shapes with the same area, perimeter can be different and vice versa. Excellent for teaching area and perimeter. The students learn to distinguish between area and perimeter while staying engaged! This is a great re-visit to introduce perimeter and area. The animation and sound on this Gizmo helps keep the attention of the students! Great Gizmo to distinguish the concepts of perimeter and area.